Moving This Month to Valley View! Lots of parking, ample classroom space mere steps from your car, better security, and in the artist-focused Valley View Center: our interim location has lots to offer! While we hope to be in our permanent location this winter, we are excited at the opportunities our Valley View location brings. How to find us: the Craft Guild will be located on the LBJ/635 side of the mall, just to the left of the entrance to Sears. Look for us immediately on your left as you enter the mall, on the first floor. While the mall has 24/7 security services, the Craft Guild is also hiring additional security for summer camps and for evening classes as we transition. Our last classes in our current location will be the week of May 8 – 14. Please don’t forget to take home all personal items on your last day of class this session; personal items left behind will be discarded. Ask your teacher how to handle any work in process. And – follow us on Facebook for the latest on the move and the opening of next session! Please remember to take ALL greenware, bisqued, and fired pieces home by May 14; pieces in process may be brought to your next class in our Valley View location to get back on their artistic journey. Watch your email for a special invite coming soon to sign up for your next class on our new site. Sent to current members only, it will include a special bonus offer good for a limited time. 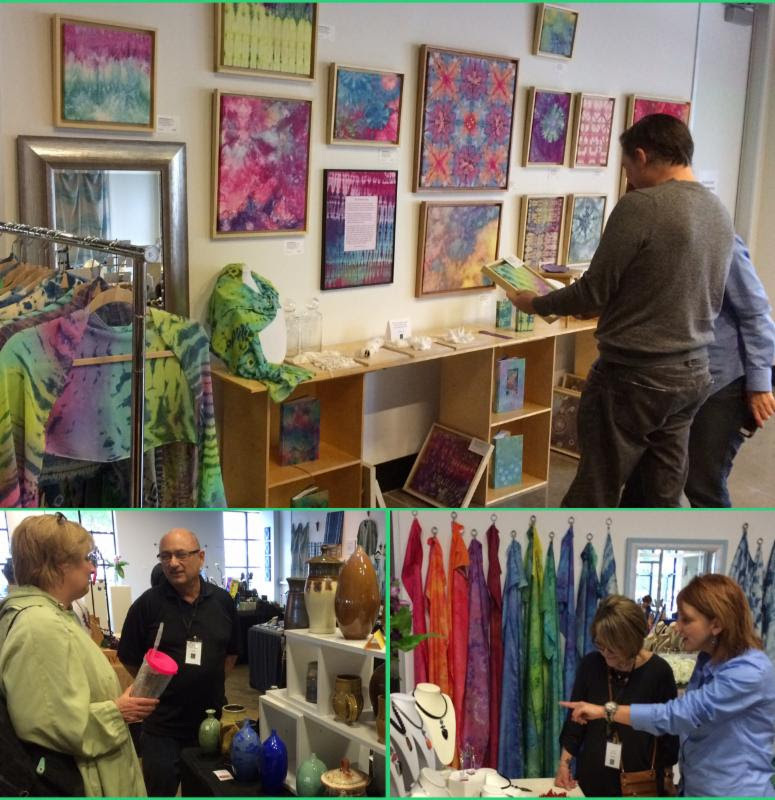 April showers brought shoppers to The Craft Guild’s 2016 Spring Show. The damp weather didn’t dampen their spirits as they spent hours browsing and buying the hand-crafted creations of participating artists. Thanks to our artists and volunteers for making this a successful show. Special thanks go to our generous Spring Show supporters: Ben E. Keith, Bitter Sisters Brewery, Elsa Grivas, Ron Lieberman, Lim’s Foods, Nancy McNeil, Martha Napier, May Dragon, Art Clay World and Wubber’s. Top photo: Lisa Covert’s booth won “Best Display”. Bottom left: Ron Lieberman chats with a shopper. Bottom right: Shoppers admiring Pat Martin’s jewelry.